Similar to my blog post last week, I’ve decided to focus back in on John Okada’s No-No Boy and a particular archival document that relates directly to the text itself and the main characters presented by Okada. Like mentioned before, the main protagonist in the story, Ichiro, has just recently returned to Seattle from being held as a prisoner of war by the Japanese during WWII, after being forced into fighting on the side of the United States while his family suffered in an internment camp. Ichiro, much like many other Japanese-American men during this time, were physically forced into participating in the war against their own country, mainly for two reasons: 1) to help America win the war through increased manpower and 2) for xenophobic fears surrounding the Japanese people residing in the US at the time. Fighting in the war served as an outlet for these xenophobic feelings that allowed a constant monitoring of these men, and an assurance of their allegiance to the US, and not Japan. 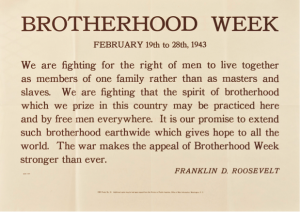 In order to unite these men, and all men who were fighting for the US during WWII, President Franklin Roosevelt issued an announcement that called for a “Brotherhood Week”, extending from February 19th-February 28th,, 1943. This Brotherhood Week, pictured above, called on these men to fight as one united front to maintain the freedoms that are made possible because of the longstanding fight the US has put up against the enemy. FDR starts off by stating that “we are fighting for the right of men to live together as members of one family rather than as masters and slaves”, which seems contradictory from the start. Not only are people, like Ichiro in Okada’s novel, excluded from this resounding “we” (which happens to be repeated three times throughout the announcement), but they are essentially positioned as the slaves forced to work – or in this case, fight – for the masters who lead this country. In the novel, Ichiro would contest the fact that he is a part of this “family” of the United States for a variety of reasons, such as that his family is being held in an interment camp while he is forced against his will to fight in a war – seemingly contradictory meanings to the word “family”, as FDR denotes. This statement goes on to call upon “the spirit of brotherhood” that these men are fighting for, and ends with a seemingly empty promise to “extend brotherhood earth-wide which gives hope to all the world”. Again, the spirit of brotherhood that FDR talks about is contradicted directly by the troubles that Ichiro faces throughout the novel, the biggest being identity and belonging. Ichiro feels as though he doesn’t belong as an American because of the terms of living he and his family are given by the government, but he also doesn’t feel as though he belongs as a Japanese man because he fought against them (again, unwillingly) and he no longer physically resides there. Because of that, the way FDR ends his announcement with a call to action for brotherhood earth-wide crumbles underneath itself, for there isn’t even a true brotherhood visible within the United States, as Ichiro would argue. Danilei, Yael, Nigel S. Rodley and Lars Weisaeth. International Responses to Traumatic Stress. Baywood Publishing, 1996. During, Simon. Cultural Studies: A Critical Introduction. Routledge, 2005. Pederson, Joshua. “Speak, Trauma: Toward a Revised Understanding of Literary Trauma Theory.” Narrative, vol. 22, no. 3, pp. 333-353. Perez, Rober. “Guantanamo and the Logic of Colonialism: The Deportation of Enemy Indians and Enemy Combatants.” Radical Philosophy Review, vol. 14, no. 1, pp. 25-47. Brown, Ed. A Soldier’s Fortune and Other Poems: Moving Past PTSD and Creating A Fun-loving Life. Agio Publishing House, 2014. Falkoff, Mark. Poems from Guantanamo: The Detainees Speak. University of Iowa Press, 2007. Lange, Dorothea. Impounded: Dorothea Lange and the Censored Images of Japanese Internment. W.W. Norton, 2006. Morrison, Toni. Beloved. Knopf, 1987. Morrison, Toni. Home. Alfred A. Knopf, 2012. Okada, John. No-No Boy. Combined Asian American Resource Project, 1976. Silko, Leslie Marmon. Ceremony. Penguin Books, 2006. I started this list with a book that covers a very broad topic, and then narrowed those general topics down as I went further into my research. I located these sources by posing two basic questions to myself: “how did colonialism help to shape a culture of conquest, and therefore, a culture of legal imprisonment that carries into the modern day – specifically from WWII and on?” and “how does literature that comes from prisoners of war differ from literature published by peripheral sources who merely report on war?”. To answer these questions, I started with a book discussing cultural studies as a theoretical lens that would be applicable to the culture of war, both in the past and present, and how cultures develop based upon the way they engage with other cultures across the world. I wanted to use this blanket term as my theoretical lens so that I can accurately understand the way a culture, both in its contemporary and its past sense, can contribute to the development of war, and how other aspects of culture (media, the public sphere, etc.) contribute to the progression and continuation of war. From there, I decided to focus on colonialism theory in relation to modern day examples of war and imprisonment to better define the effects of colonialism, and the way colonialism can lead to war, imprisonment, and empires. I chose an article that encompasses this idea of colonialism, while also applying it to Guantanamo Bay to give it a more contemporary edge – and one that starts delving further into my interests with prisoner of war literature. I then chose two articles that deal directly with the responses to trauma and stress – specifically that trauma and stress as it is derived from war and unfair imprisonment. One focuses more on the way literature acts as a point of relief from trauma, which will help to lead into some of my primary sources about prisoner of war poetry and inmate literature. The other focuses on how the world views traumatic stress, and how trauma theory (later coined post-traumatic stress disorder, or PTSD) are accepted or pushed back on in society. My reading list hasn’t shifting very much in terms of theoretical or secondary works, but I’ve made some definite headway in terms of some primary sources I plan on engaging with to progress my ideas about trauma theory and PTSD. Although I placed a lot of emphasis on colonialism and how it affected the current culture of imprisonment (from WWII and on), I’ve been dealing with a lot of primary texts that deal with reports of trauma, stress and homelessness (as in, a feeling of a lack of a true “home”) to play further into the side of PTSD and the affects of trauma after war, imprisonment, etc. I’ve had some really great conversations with Professor Seiler about the primary texts that would be appropriate to incorporate in my work, and how they can further my understanding of how these traumatic events take action on the minds and self-awareness of victims of trauma. Both Poems from Guantanamo Bay and A Solider’s Fortune and Other Poems show how literature has helped to aid in the recovery of people experiencing PTSD, while Beloved, Home, No-No Boy and Ceremony explain the aftermath of trauma in someone’s life, in terms of hallucinations, alcoholism, self-destructive behavior, isolation from friends and family, and heightened anxiety. I also added a book (Impounded) that details the lives of the Japanese during the time of internment in the US in hopes of adding another main event in US history to my realm, and to place more emphasis on imprisonment and PTSD as well. Although I’m still adding and deleting things from my primary source list, I feel as though the books I’ve chosen to focus on shed light on some of the main touch-points of trauma theory and PTSD that I want to focus on. In addition to choosing my primary sources, I also found a new academic journal I plan to work with that is more relevant to the ideas I want to focus on in my research. The articles in this journal focus on the history of colonialism, starting in as early as the 10th century and into the current times, which aligns perfectly with what I want to focus on in terms of how colonialism spawned the ideas of war and imprisonment, and how those practices have continued on into the modern day. For this blog post, I chose to focus on a text that came out of one of the scholarly articles that I originally referred to on my reading list. That article was “Speak, Trauma: Toward a Revised Understanding of Literary Trauma Theory” (2014) by Joshua Pederson, which uses trauma theory and psychoanalytic theory as a lens to understand how literature aids in the healing process of people who experience remarkable trauma in their lives. Pederson refers to Cathy Caruth many times in his argument, citing her as “an important first-wave trauma theorist” (Pederson 334) who contributes to the understanding of trauma theory and how trauma, as it is described, shapes history. Because of his references to her, I decided to look into her own texts, which proved to be relevant to my own interest with trauma theory. For this post, I will be focusing on Caruth’s book Unclaimed Experience: Trauma, Narrative and History (1996), which, in essence, discusses the confusing experiences of trauma, the disparities in explaining trauma from the victim’s perspective, and the consequences of trauma – as it has become more relevant in society – that make it hard to document history based on straightforward experience and reference. Trauma essentially clouds history for those who experience it, causing a biased and sometimes inaccurate portrayal of history. This book, published in 1996 – not long after her first book, titled Trauma: Explorations in Memory (1995) – is considered one of the first critiques of trauma as it was used in historical references, and Caruth was seen as a trauma theorist who helped to develop the language that surrounded this idea. Her work introduced fairly new ideas in the trauma theory field, which have still stayed relevant today. Her ideas from this book have been cited and referred to in numerous publications, anywhere from peer-reviewed articles and journals to books where chapters are dedicated to her theories – playing to her prestige and the importance and influence that her theories had on trauma theory as a whole. On the same note, Cambridge University hosted a colloquium surrounding her work in 2011, dedicated to discussing and applying her theories to modern day events. Jean Wyatt, another published author, explains that trauma theory “is dominated by the theoretical framework that she [Caruth] introduced” (Wyatt 31). Caruth’s theories clearly had a lot of clout over the way trauma theory was viewed, and her work is still referred to today in regards to a plethora of historical events. Her theories have been applied to many historical events/groups of people who have experienced trauma – anything from WWII/Holocaust and Japanese internment survivors to Trinidad slaves and the “War on Terror” prisoners of war. Her theories are applicable to all of these traumatic events and the people who experienced these wide-ranging traumas, showing how well thought-out and important her works stand to be. After furthering my research and honing in on the type of work I want to investigate and under what lens, I was able to locate a distinct binary that continues to pop up in my research, and in my own thinking about my research. That binary is composed of the words “Post-Traumatic Stress Disorder (PTSD)” and “trauma theory”, which both deal with the effects and aftermath on a person after experiencing a traumatic event in their lives, but they also embody some distinct differences as well. Post-traumatic stress disorder is a disorder coined in the mid-20th century to describe “a serious condition that can develop after a person has experienced or witnessed a traumatic or terrifying event in which serious physical harm occurred or was threatened” (WebMD). PTSD is experienced by the first-hand victim of the event and is a chronic disorder that pops up on different occasions or under different circumstances throughout the victim’s life. The general concern of PTSD patients is with “personal safety” (Stein 1) and it can reoccur at any point in one’s life. It does not transcend beyond the initial victim of the traumatic event, but rather, only affects the person who experienced the event on a first-hand basis. It deals with linear time rather than monumental time, and is physically and emotionally present and visible through outward and explicit expressions of stress. Much like trauma theory, the responses and memories of trauma “are unreliable and influenced by mood […] therefore questioning the accuracy” (Stein 9). In direct contrast, trauma theory arose around the same time period and stemmed from the research behind “traumatic amnesia”, which is a condition when someone “has an inability to remember an intensely painful experience” (Pederson 334). This theory says that victims may be unable to communicate their trauma verbally, if at all, and may use literature or other forms of writing to attempt to describe their trauma in a clearer way, which was discovered under “the first wave of literary trauma theorist, among them Geoffrey Hartman, Shoshana Felman and Cathy Caruth” (Pederson 334). This trauma transcends linear time and deals with monumental time, as this type of traumatic experience can affect not only the victim, but also lasting generations of people who have contact with the victim – such as family and close friends who have extended contact with the victim. These two remarkably similar, yet still very different theories, bring up some questions that point to more obvious differences between the two, so that I can hone in on which term would be more applicable for my research and why. Such questions include asking if PTSD is a respondent term for trauma theory, which begs the question around which term came first, and how did one term affect the other term? Another question I have is regarding the concrete things that mark the difference between PTSD and trauma theory, and how are these units of measurement are determined. To determine how accurate this binary is, and if this is a solid binary to continue researching, I would like to further question if there is a real difference between the two terms, or if one spawned from the other. Similarly, did one particular event or case study cause these terms to be developed – and how similar were these instances? If these two terms are distinctly different, are they different enough to the point where I can distance them from each other and focus in on one that would be more applicable to my study of POW literature and literature as a therapy for trauma. I’ve realized that there might be a danger in assuming that all victims of trauma consequentially experience PTSD, or vice versa, because that would disqualify much of the research that justifies why people are plagued with PTSD and the symptoms that are specific to PTSD. Because of this, I understand that it would be more accurate to take into account the chronology of when these two terms were coined, and how one term may have influenced the other. By answering the questions I posed above and establishing the differences between PTSD and trauma theory, and how they are both related and different, I will be able to focus in on how I want to put these terms in conversation, both with one another and with my primary sources that deal with POW literature and therapy literature. Pederson, Joshua. “Speak, Trauma: Toward a Revised Understanding of Literary Trauma Theory.” Narrative vol. 22, no. 3, 2014, pp. 333-353. Stein, Dan J. Post-Traumatic Stress Disorder. John Wiley and Sons, 2011. A keyword that has become relevant, and we have considered regarding a few different points of discussion in class, is literary canon, first presented to us by John Guillory in his piece “The Problem of Literary Canon Formation”. Guillory discusses the ways in which “the school is the vehicle of transmission for something like national culture” (1589), and how that transmission of culture is largely determined by “reference to the High Culture artifacts to which access is provided in schools” (1589-1590). I plan to lean into that sentiment and argue with it, reasoning that cultural artifacts come in different forms than, say, the great American novel, and extend to primary texts written by less glorified authors, who have just as much clout and cultural knowledge as the authors that tend to be studied most heavily in schools. My initial background research, which originally revolved around WWII, led me down a path that focused less on writing that came from more prominent writers of the time, and instead honed in more on writing that came directly out of the people who experienced this wartime firsthand – and in an unconventional way. I’ve become extremely interested, most specifically, in the writing that came from prisoners of war and detainees of war and torture camps that were published either after their release, or while they were still imprisoned in a prison or a camp. Based upon some secondary sources I encountered during my research, I’ve come up with two main keywords – or key phrases, in my case – that are used throughout, and really get down to the nitty-gritty of what my interests revolve around. Those words are inmate poetry and prisoner of war literature. These two key phrases are used throughout the texts I have engaged with and target the differences between the type of work that came out of wartime from bystanders or people indirectly involved with war, as opposed to those – like inmates and POWs – who have experienced the traumatic repercussions of war firsthand. As opposed to other literature composed during times of war, poetry and other works written by inmates and POWs offers an outlet of expression for these solitary people – it is their sole connection to the outside world and the way they express their thoughts, feelings and experiences throughout their confinement, regardless of if their work will be read by others or not. Their experiences and unfortunate circumstances are sometimes expanded upon, but more often than not, they are creative ways of expressing their feelings of their journey from free person to incarcerated person. Repeated often is language that represents thoughtful reflection of their own self, along with a reflection on the hardships of war even more generally. This type of literature differs greatly because the authors are so directly immersed in the effects of war, rather than viewing the effects from an outside perspective. In looking at my keywords, I came up with a question I wanted to propose to myself as I went forth with my research to further target the reasoning behind why literature from inmates and POWs at wartime is important and interesting to me. I asked “how does literature written by inmates/prisoners both aid in the healing process and act as an alternative, yet still historically accurate, representation of wartime during a specific period in history?” From that, I considered some binaries that were present, like aid/hinder, healing/neglecting, inmates/free persons, historically accurate/historically inaccurate, and wartime/peace. All of these binaries pose certain questions that I wish to explore more, such as “do inmates, who have limited access to resources, write in the same manner or about the same sorts of things as free people?” And, “are these piece of literature from incarcerated people considered historical documents that contribute to the overall discussion about this period of time, or are they of their own separate category?” And lastly, “does literature composed and circulated during the pressures of wartime have different effects on society than literature composed and circulated during a peaceful time?” All of these questions, created from the binaries I discovered in my initial research about my interests, are worth considering as I delve further into this area of work. By using these keywords, I expect my research to be narrowed enough that I can refine all wartime writing down to pieces that have been composed by unconventional authors, but also still broad enough that I’m not eliminating works that could have been published, edited or produced by secondary authors who report on the stories of inmates, prisoners, etc. I plan to continue to use these key phrases to direct my research as I look to find sources, both primary and secondary, which help to answer some of the questions I proposed above. In the short story “Harrison Bergeron”, Kurt Vonnegut describes an America that finally embodies equality in the truest form, where no one person overshadows any other person, and all people who have any additional talents or good looks are stifled by the government’s stringent laws. This reading, both deeply dark and ironically satirical, captures a real-life critique of the core values that America prides itself on – and supposedly carries out in the most effective way – while pointing to the obvious flaws regarding some of these beliefs. Vonnegut makes his satirical target very clear from the get-go, stating “the year was 2081, and everyone was finally equal […] they were equal every which way. Nobody was better looking than anyone else. Nobody was stronger or quicker than anyone else (1). It seems as though Vonnegut directly responds to the Declaration of Independence that America was founded on, which states that “all men are created equal” – and Vonnegut refutes that by saying that, some 300 years after this document was created, America has finally gotten it right and made everyone equal through extensive trial and error. Vonnegut indirectly reveals his thoughts on total egalitarianism through his tale revolving around Hazel, George and Harrison, pointing out that although an aim for true equality is understandable, a world in which everyone is leveled off under the same conditions could be dangerous. Vonnegut touches on this in the second paragraph, stating, “some things about living still weren’t quite right, though” (1). He starts the second paragraph off with this contradictory statement to undercut the happiness and thrill that one might feel about a place that embodies genuine equality to its most literal sense. The use of the word “though” reveals that, although at surface level, true equality might seem to be an ideal situation, there are severe downfalls to placing everyone on the same playing field in a functioning society. Vonnegut furthers this outlook in the way he chooses to describe how equality is achieved in this futuristic society. He uses the word “mental handicap” (1) to describe how George, a superior man with above-average intelligence, was handicapped and unable to utilize his natural given talents because of this all-equal society that is America in 2081. He was “required by law to wear it at all times” (1) to ensure that he would never have more intelligence than any other person, namely his wife, Hazel, in this case. Vonnegut’s choice in diction emphasizes the unfair nature of this “handicap” that was mandated by the government and placed on people who were more capable – smarter, prettier, happier, etc. – and further emphasizing the issues with a truly equal society. The word “handicap” has a distinct stigma attached to it that implies a quality that hinders ones success and power to perform basic tasks to the best of one’s ability. By placing a “handicap” on people, like George and the performing ballerinas, the government is disallowing them to utilize their full talents and skills. Vonnegut’s short story portrays a supposedly ideal culture of equality and balance between all people of society. Vonnegut inserts both his own personal outlook on egalitarianism, as well as the effects he projects would happen should this type of society be implemented. Through directed diction and phrases comparable to historical American documents, Vonnegut displays the problems with true egalitarianism and how that outlook could affect society in the long run.